This is the one you've been waiting for! Featuring 53" of rip capacity, a quick-release bade guard, interchangeable riving knife, encapsulated-blade dust extraction, and a highly efficient serpentine belt/pulley system that runs much quieter and smoother than its predecessor. 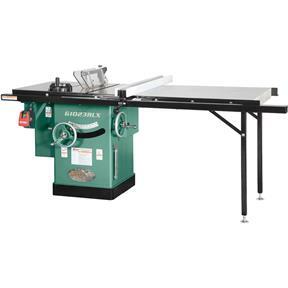 This left-tilting table saw includes the tremendously popular Shop Fox® Classic fence and heavy-duty extension table. Best of all, everything is included for one low price, making this one of the greatest package deals available anywhere. CSA certified meeting CSA C22.2 #71.2-08 and UL 987 standards! 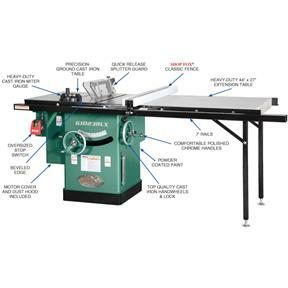 Extension table: 44" x 27"
5/8" diameter arbor is long enough to accept dado blades up to 13/16"
Maximum depth of cut @ 90°: 3"
Maximum depth of cut @ 45°: 2-1/8"
Approximate shipping weight: 550 lbs. Includes 10" x 40T blade! I bought this saw a month ago. 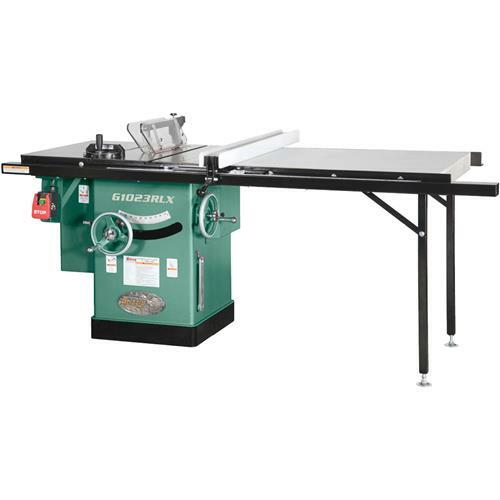 Great saw, the only problem was the extension table top was very poorly made but called Grizzly and a new one was sent. Great service. wish i had bought this saw 10 years ago. went together great. little fine tuning to do. everything was almost perfect. wish there was hooks or slots for the miter gauge, wrenches, and dado insert. I love to work with wood building toys and things for my grandchildren, family and friends. 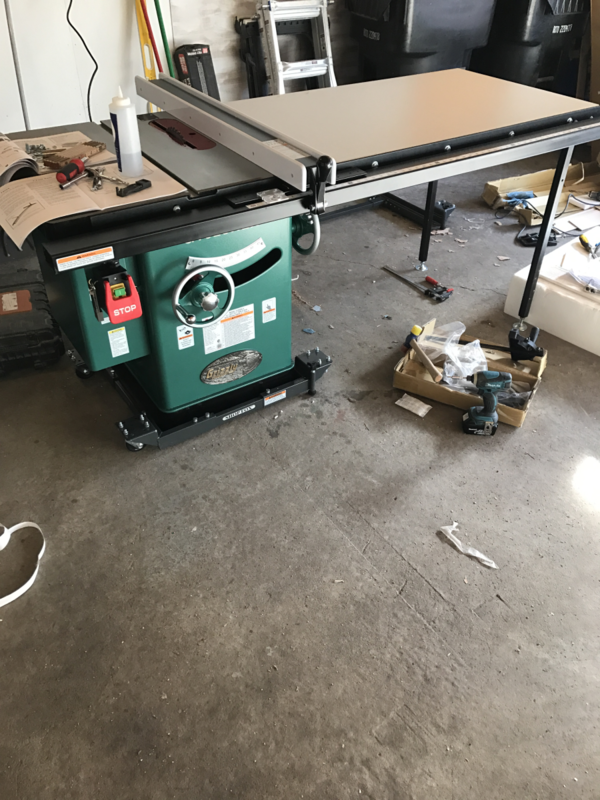 A couple of months ago I pulled the trigger and bought this G1023RXL table saw. I am very happy I did. There was only one issue with the saw upon delivery. The front tube rail was bent. After contacting costumer service, they immediately shipped me another one. Now all is good! Also, putting everything together was a piece of cake. Thank you Grizzly. Very happy with the quality and performance of this saw. I have been using a Craftsman for over 20 years, and the Grizzly is in a different league. The only issue I had setting it up was to fine tune the extension table. It seemed to have a slight bow in it, but was able to flatten it with strategically loosening/tightening the rail bolts, and using a hammer and board (high tech stuff). The settings for the blade, fence... were right on, or close enough out of the box. Speaking of boxes, the rail box in delivery was a bit damaged when received (about two feet of rail was exposed). A small gash is on the rail, but it is hidden and doesnt cause any issues. Very happy with the saw. Easy assembly with few adjustments to make everything square. Full power, heavy, nice fence. Only complaint is the extension table. Its made of particle board and not well made. I had to wait a while for this one as it was back ordered, but it was worth the wait. I'm quite pleased with it. I would give it a 4 1/2 if I could. Delivery by UPS freight was great. I have a very long driveway that I was sure no semi driver was going to want to back down, so I had it delivered to my work, and paid the extra few bucks for lift gate service. The UPS driver used the lift gate to put the saw directly into the bed of a pick-up truck which I was able to then drive right to my front door. 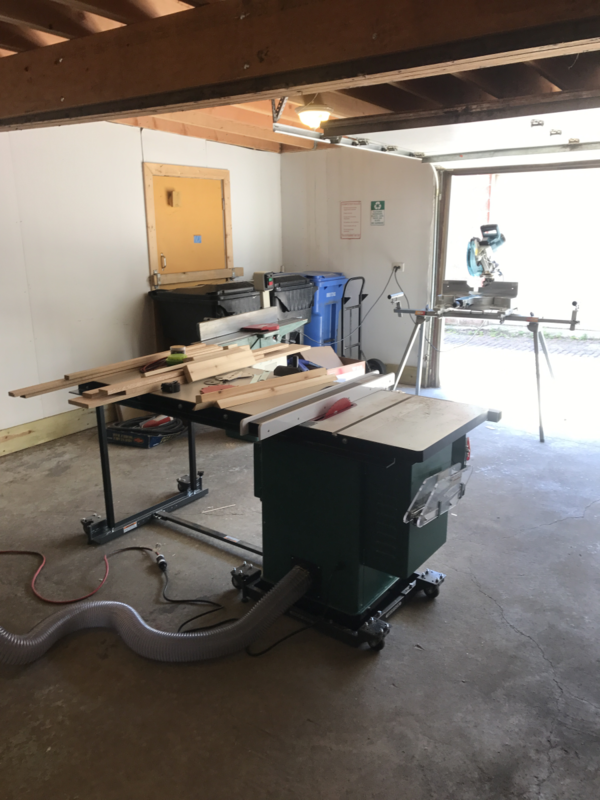 With the help of 3 other guys, I was able to get it down the stairs and into my basement shop. It came in 5 boxes. 4 of them were quite manageable for one person, the 5th was the main part of the saw and it weighed just over 400 pounds. I only have a 30 inch wide stairway leading to my shop, but it fit with 1/2 inch or so to spare. Un-boxing and assembly went pretty well. The saw and all it's parts were in immaculate condition. Fit and finish were near perfect and better than I expected for the price paid. It was set up very well out of the box. The table and the wing were as flat as I've ever seen when checked with a machinists straight edge. The parallelism between blade and miter slots were within 1/1000. I didn't think I could get it any better, so I left it. The 90 degree stop was perfect. The 45 degree stop was off by a degree. The fence was off by 1/4 of a degree. Adjustments were easily performed. There were 2 minor issues during assembly. First was on the left side cast iron wing. There was a hole in the front side of the wing a couple inches from the far left side that was supposed to be counter-sunk. The hole was used to attach the on/off switch, but it was necessary for the bolt provided to be either totally flush, or slightly recessed, otherwise it would interfere with the installation of the front rail. There was a corresponding hole on the back side of the wing that didn't end out getting used for anything, and it was countersunk. My guess is that they accidentally countersunk the back one instead of the front one. Fortunately, I had the right drill bit on hand to countersink the front side and was able to continue on. The second issue was really just an irritation. At one point during the installation of the extension table, I had to go back and undo a few steps that the instructions had already had me complete. It was a waste of maybe 10 minutes, but it was an unnecessary delay as all they have to do is make a change to the assembly instructions. Once assembled and fine tuned, I powered it up. It was quiet, solid, vibration free, and extremely powerful. The dust collection is excellent. It is a joy to use and it's a beautiful saw. I was also pleased to see it came with a dado insert as they could easily have tried to made an extra $40 on that. Beyond the two minor problems during assembly, I have 3 other minor complaints:1) The thickness of the extension table. If you are just going to use it as an extension table for your saw, it's perfectly adequate. But if as I intend, you want to drop a router lift in it, you should plan on making your own table or gluing another layer of MDF to the bottom of the one they provide. I knew I would be getting MDF, I just thought it would be a full 3/4 thick with the melamine on top of that. What I got was about 21/32 including the melamine. By the time I take out 3/8 inch for the router lift plate, I don't feel like that's enough material to support the lift and the router. 2) very awkward getting to the release button for the riving knife/blade guard. I generally just leave the riving knife in, so not a big deal for me, but if you switch between a blade guard and a riving knife often, this will probably be a frustration for you. 3) I wish the power button were easier to find. Maybe I'll eventually find it by feel, but after a month, I still find myself having to take a step back from the saw and visually find the power button to turn the saw on. This is not true of the power OFF button. It is a large red paddle switch that is easily found without looking. All in all, I am very pleased. I think it is a better saw than others that sell for quite a bit more. I would take it over a Jet or a Delta any day. If money was no object, I suppose Powermatic might have the edge, but let's face it, for most of us....money is an object. 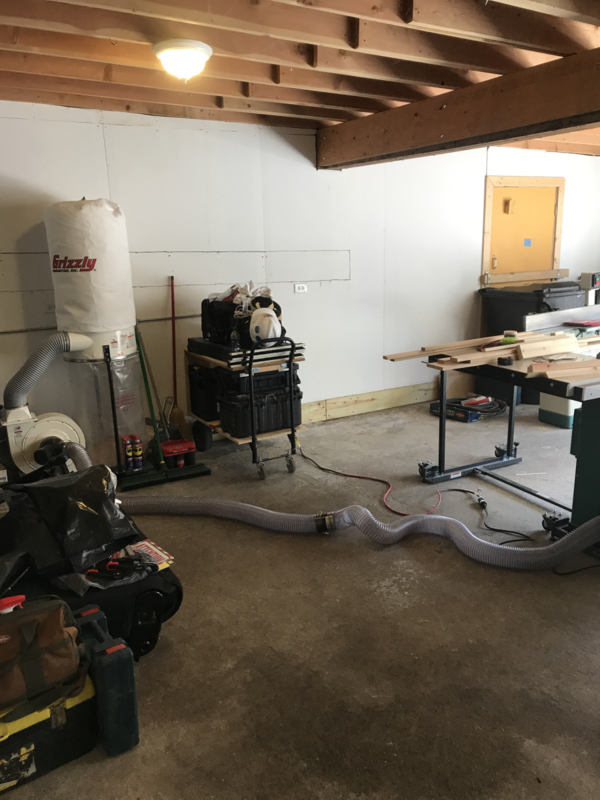 At this point, I have a jointer, band saw, dust collector, and table saw all by Grizzly. When you take quality, parts availability, service, and price all into account, I don't think you can do better. Unless something changes for the worse, I will continue to buy Grizzly for all my large woodworking tools. This is a good saw but we have had two problems. We had to replace the extension table as it is made out of flimsy 1/2" MDF. We replaced it with 3/4" melamine coated plywood. We also had to replace the arbor wrench wrench as the open end arms failed. We had a local metal shop cut one out of 3/16" steel with wider arms for greater strength. I bought this saw as a second saw for my workshop. I have 2 complaints with this saw. The first is the crank on the blade height adjuster is VERY HARD to turn. Sometimes I have to get down on a chair so I can get enough leverage to turn the crank. My delta Unisaw (which I have had for many years) adjusts very easily. I can spin the crank with one hand. My second complaint is the time it takes for this saw to stop after it is turned off. It spins forever. It should have a brake like my radial arm saw. My Unisaw stops in about 5 seconds. This one takes about 15. That doesn't sound like much but when you stand their all day long waiting for it, it gets real old real fast. I make kitchen cabinets and my saws run all day long. All in all this is a nice saw, just not as good as it could be. I owned a business and I had many tools from Grizzly most tools were over 25 years old and they all still worked with not many problems and I sold them all at a auction and moved out of the state. Now I need a few tools for my personal use and I will buy all Grizzly Tools again. 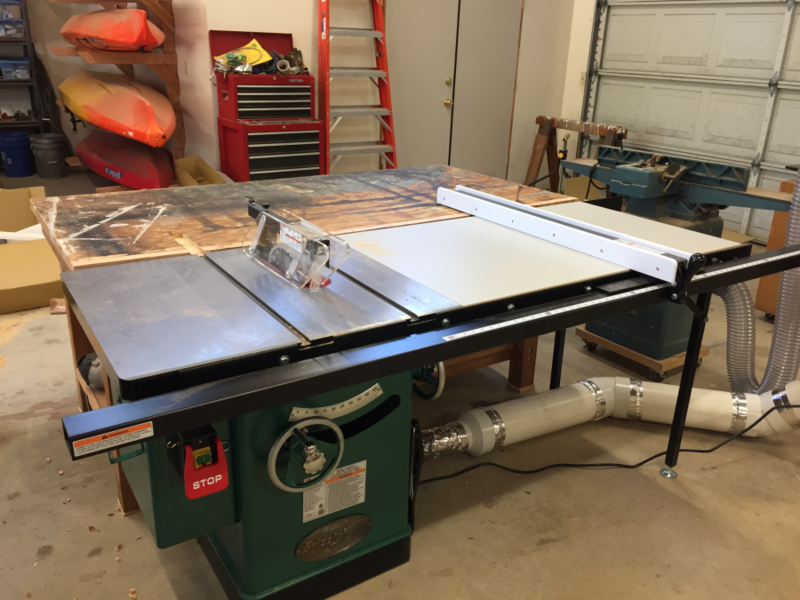 I have not used the table saw yet waiting on getting the electric hooked up in my garage. Have had this saw for a month now and operates as advertised. Wasn't happy to find out the extension wing was a melamine mdf, a warped one at that. This will probably not last long as we cut a lot of sheet goods and will have to order a steel replacement in a year. Overall a decent saw. the table saw is amazing. plenty of power with a quiet motor. I was not happy with the assembly. I had two manuals telling me different things and in the end I had to buy new hardware to make the table legs work correctly. The blade and the main table align perfectly without adjustment so that was great to see. This has been great so far i really like it . I would recommend this to anyone . I got my saw a few weeks ago and now have it set up and running. I went to check the alignment and got a surprise. I put my dial indicator on the blade to check the run out and the needle did not move. I thought my indicator was stuck, but it wasn't. It was dead on. I checked the other alignments and they were all right on the money. The saw was easy to set up, even by myself with no help. I could not be happier. The fence was very good, better than what I was used to. The only thing I could see that could be better was the curser. The parallax was more than I would like to see. Thanks for a great saw. I got more than I paid for and better than anything else twice it's price. I've been a professional Industrial Maintenance Tech for many years, and setting up machines is nothing new to me. Set up with this was a bit more difficult than I expected until I went out and replace all of the SAE ungraded nuts and bolts with quality grade 8 plated hardware. After doing that set up was a breeze and everything dialed in perfectly. If it wasn't for the ungraded hardware, I would give it a 5+, but as it comes in the crate I'll give it a 4.5. Just change out the hardware and you'll have a GREAT machine. Only one small gripe from me is something to brag about for sure.